When you pick Nicholas Sparks books you know what to expect of it ~ a poignant love story. That is what I was exactly looking for when I picked up the book. I wanted an easy read, which the author's book definately are- not in the wrong way of course. This is the fifth book I have read of the author this year and I am simply not tired of reading his books. 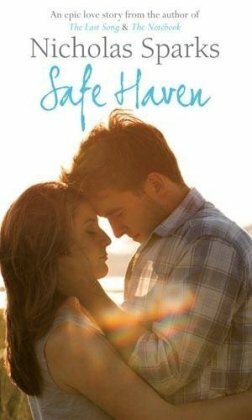 Safe Haven is different from all the other books I have read of the author. Of course, there is romance but Sparks has added a new twist in this story. It can be rightly called a romance thriller. Full of twist and turns and a suspense factor, I really found it unputdownable. I am quoting the blurb from the book for the synopsis. "When a mysterious young woman named Katie appears in the small North Carolina town of Southport, her sudden arrival raises questions about her past. Beautiful yet self-effacing, Katie seems determined to avoid forming personal ties until a series of events draws her into two reluctant relationships: one with Alex, a widowed store owner with a kind heart and two young children; and another with her plainspoken single neighbor, Jo. Despite her reservations, Katie slowly begins to let down her guard, putting down roots in the close-knit community and becoming increasingly attached to Alex and his family. But even as Katie begins to fall in love, she struggles with the dark secret that still haunts and terrifies her . . . a past that set her on a fearful, shattering journey across the country, to the sheltered oasis of Southport. With Jo’s empathic and stubborn support, Katie eventually realizes that she must choose between a life of transient safety and one of riskier rewards . . . and that in the darkest hour, love is the only true safe haven." If you love Spark's book you cannot simply miss this one and if you do not like his writing, I think you should try this. This book kept me on tenterhooks as the story unravelled slowly and turned more dramatic than I thought it would be. I really enjoyed reading it. Like many others of Sparks Novel, this is also going to be made into a movie and is going to be released in June 2012. I will be definately watching it. Vist http://www.nicholassparks.com/ to know more about the author and his works. I am linking it to Nicholas Sparks reading Challenge hosted by The Book Vixen along with the other books Sparks book I have read so far namely The NoteBook, The Choice, The Last Song and Dear John.